Please call (207) 929-8678 to order this perishable product. Our Rockweed for lobster bakes and clambakes is hand harvested from the cold, clean waters along the coast of southern Maine. We use either a sharp-bladed knife at low tide, or work from a small boat using a long-handled rake when the tide is high. 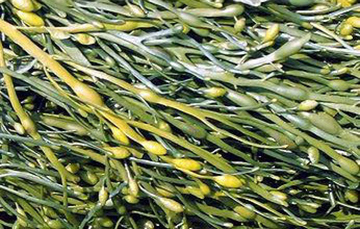 The product is hand harvested to keep the plants long for lobster bakes and clambakes because the rockweed pockets will rupture during cooking to provide moisture and sea salt to add flavoring to your food. It is then gathered and brought to our refrigerated storage facility where it is kept fresh for your order. Summer time is a great time to throw your own clambake or lobster bake. Read our article on doing your own clambake or lobster bake this summer. Pricing includes FedEx Ground Shipping in the continental USA…. We do not ship outside the USA. Call (207) 929-8678 now to place your order! Please note: Please call 7-10 days prior to your event to assure Fedex Ground pricing! We do offer overnight airfreight and 2/3 day shipping at FedEx rates.